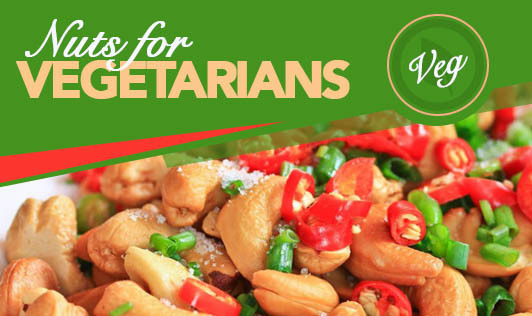 For vegetarians, nuts can provide many of the nutrients that are otherwise normally obtained from animal sources. These include proteins, B-complex vitamins, and minerals such as phosphorus, iron, copper, and potassium. Combining nuts with bread, grains, and pulses such as soyabeans in the diet supplies a healthy balance of all the essential amino acids. Nuts are also one of the richest vegetarian sources of vitamin E.
Nuts are also high in fat and hence it is safer to limit their intake to only a couple everyday. Commonly used nuts are almonds, walnuts, groundnuts, pistachios, and cashews and these can be eaten as such or mixed with breakfast cereals, salads, or desserts. Moreover, they are also a good source of magnesium and fiber. Both these have been shown to help the body use insulin more efficiently, a step that would reduce diabetes risk. Nuts are a prime source of polyunsaturated and monounsaturated fats which are good for insulin sensitivity. When nuts are eaten with other foods, they may control the rise in blood sugar caused by those foods as well. Nuts are also known to reduce the risk of cardiovascular diseases. Nuts are best eaten in the natural form (not salted or caramelized versions), and in moderation. They can serve as the best mid-morning or evening snack. All nuts are more or less the same in calories, the lowest being almonds (23 nuts- 160 calories, 6g protein, and 14g fat), cashews (16 to 18 nuts, 5g protein, 13g fat), and pistachios (49 nuts- 6g protein, 13g fat). These portions will keep you feeling full for longer periods of time and prevent you from overeating at lunch or dinner. Furthermore, it is important to remember that each variety of nut comes with its own set of nutrients. Almonds contain four times more fiber than cashews, but cashews contain twice as much iron and zinc as any other nut. Pecan and walnuts have a good balance of all nut nutrients- potassium, calcium, magnesium, and zinc. It is therefore essential to include each type to get the right mix of nutrients.